Gay asylum seekers who arrive in Australia by boat will be resettled in Papua New Guinea despite facing prison under local laws that criminalise homosexuality, the attorney-general says. In Sydney to announce federal funding for the HIV/AIDS Legal Centre, Mark Dreyfus said no group of asylum seekers would be ruled out of the government's new policy to send them to PNG. "It's a general policy that anyone who arrives in Australia by boat without a visa ... will be transferred to Papua New Guinea," Mr Dreyfus told reporters. Homosexuality is illegal in Papua New Guinea and can attract a jail sentence of up to 14 years. "At the same time our minister for immigration Tony Burke has made it very clear that those transfers won't occur until there is appropriate accommodation and appropriate circumstances for everyone who is sent," he said. Asylum seekers aboard boat. - Source: ONE News. Mr Dreyfus said Australia would not pressure PNG about changing its laws. "We don't think that that's necessary in order for Australia to comply with our international legal obligations and the obligations that we have under the Migration Act. "I'm not going to give you a running commentary on laws of countries in our region." Most recently in 2011, the PNG government told the United Nations it had no plans to decriminalise homosexuality.Mr Dreyfus was at the HIV/AIDS Legal Centre with Federal Health Minister Tanya Plibersek to announce an additional $80,000 in federal funding over four years. Meanwhile, the Australian federal government says the coalition has erred by putting a figure on the number of asylum seekers it wants to house in a proposed tent city on Nauru. The plan revealed by the coalition on Tuesday involves erecting a 2000-person tent city and expanding Nauru's asylum seeker capacity up to about 5000. Immigration Minister Tony Burke said expanding offshore processing in Nauru had merit, which was why he'd raised a similar idea with the island nation's leaders just last week. But the opposition had been "grossly irresponsible" and made "fairly dire errors" in rushing the policy out and putting a figure on the capacity for the proposed facility. 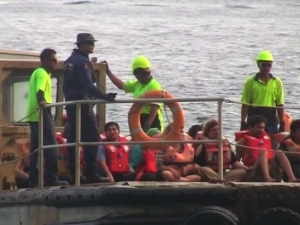 "People smugglers want to know the figure," Mr Burke told reporters in Sydney on Tuesday. "The coalition are putting up in lights, `If you want to overwhelm the policy, here's how'." Mr Burke also said the coalition's plan to increase offshore processing was effectively an admission it's turn-back policy wouldn't work. "Today is the day that (Opposition leader) Tony Abbott effectively admitted that turning back the boats won't work," he said. Mr Burke called on the coalition to rule out the possibility of asylum seeker boat arrivals being allowed to resettle in Australia, as Labor had recently done. Mr Abbott brushed off concerns his plan could establish a tent "slum" on Nauru, saying tents would eventually be replaced with permanent shelters. He described Nauru as a "pleasant island". "Nauru is by no means an unpleasant place to live," he told the Seven Network. It also wants to turn back boats, issue temporary protection visas and increase capacity at Papua New Guinea's Manus Island. The first asylum seekers to be taken to Manus Island under Labor's new resettlement policy could arrive as early as Tuesday afternoon. Home Affairs Minister Jason Clare also dismissed criticism from the Fijian government that Australia's asylum seeker resettlement plan for PNG could spark social instability. He said people smuggling was a regional problem requiring a regional solution. "This is about two next door neighbours, two friends, helping each other out," Mr Clare said. Sending people to PNG would help remove the incentive to get on a boat bound for Australia. In return, PNG would receive Australian support for health, education and law and order projects, the minister said.